The Inquiry hearings will resume at 10 a.m. on Wednesday, April 24, 2019. Participants were invited to make opening submissions in writing. The opening submissions the Inquiry received are now posted to the website here. 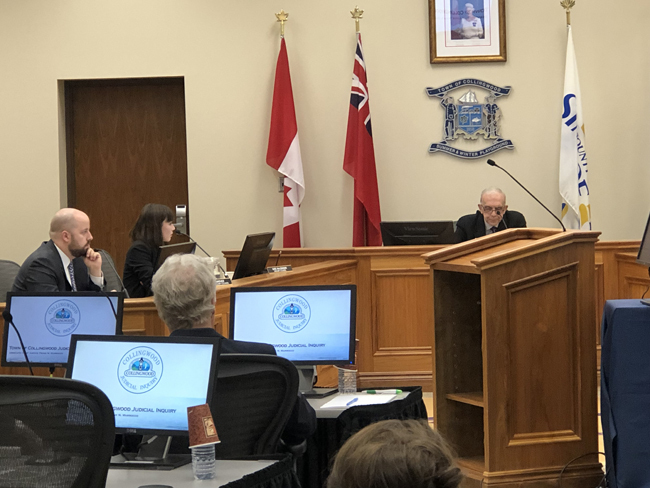 The Inquiry’s public hearings began on Monday, April 15, 2019. The hearings schedule and witnesses scheduled for the upcoming hearing days are available here. The list of anticipated witnesses is available here. These lists are subject to change and will be updated as required. The Inquiry’s public hearings will start on Monday, April 15, 2019, from 10 a.m. to 4 p.m. The hearing schedule and the list of scheduled witnesses are available on this website. They will be updated as required. Seating space for the public in the hearing room is limited. However, the hearings will be carried live by Rogers on cable and the Internet as well as archived. Transcripts will also be available online at the end of each day. The Foundation Document – a chronology of events, with links to documents that have been provided to the Inquiry – has now been posted. Please note that the statements in this Foundation Document have not been tested for the truth of their contents. The contents may be tested, challenged, supplemented, proven false, or discredited through the evidence called and the submissions made at the Inquiry. It will be for the Commissioner to consider all the evidence before ascribing any weight to anything contained in the Foundation Document. John Mather has joined the Inquiry as Associate Counsel. He will fill the role of Kate McGrann, who has become lead counsel following the appointment of Janet Leiper to the Superior Court of Justice. Mr. Mather's biography is here. a comprehensive public overview of the information disclosed to the Inquiry before the hearings. The Foundation Document will also provide structure and context for the evidentiary hearings in the context of the large number of documents produced to the Inquiry, the length of time that has passed since the events that are the subject of the Terms of Reference occurred, and the nature of the transactions which the Town of Collingwood asked the Inquiry to examine. Lead Inquiry Counsel Janet Leiper has been appointed a judge of the Superior Court of Justice of Ontario by the Government of Canada. The Inquiry judge, Frank N. Marrocco, has named Kate McGrann lead counsel, replacing Justice Leiper. The Inquiry’s work will continue without interruption. The Inquiry has now sent out summonses to those people likely to be called as witnesses during Part I of the Inquiry, which deals with the sale of Collus shares. That part of the inquiry commences April 15, 2019. Issuing summonses is a required legal process. It may be that not all witnesses who receive a summons will be required to testify. For example, in some cases, a witness’s evidence may be received in writing or, as the Inquiry progresses, it may be that a witness is no longer needed to give evidence. Inquiry Counsel will continue to seek input from the participants in planning the hearings to assure that the hearings are conducted thoroughly and efficiently.